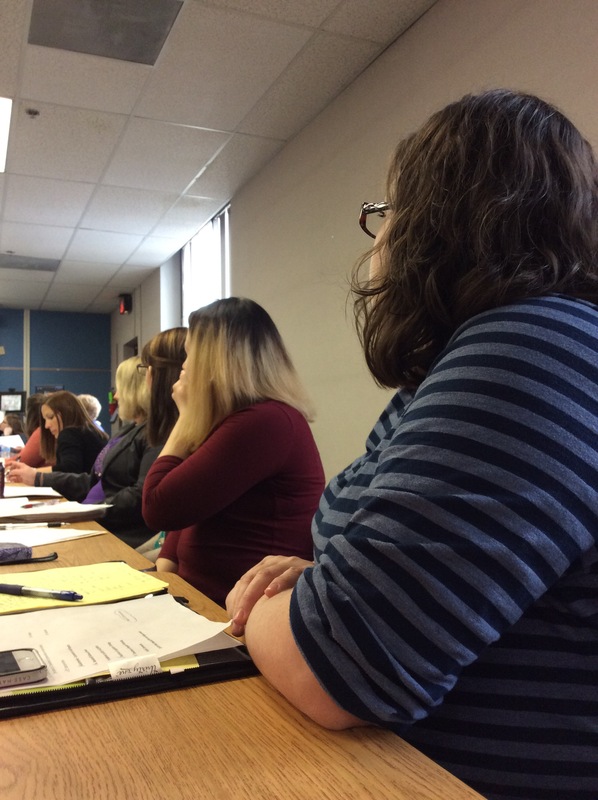 Today I attended the quarterly meeting of the Newborn Screening Advisory Panel of Pennsylvania as I did in April and will continue to do until Krabbe is on the mandatory screening panel (and maybe even after that, but we’ll see). You can read about the April meeting – and some background about the purpose of the Advisory Panel – here. You can read about the meeting with the Physician General in June here. Testing for X-ALD will begin on April 1, 2017 and testing for MPS-I will begin on January 1, 2017. Both of these are lysosomal storage disorders (LSDs) just like Krabbe. There are funding issues being worked out at the moment, but the panel is hopeful that these implementation dates will remain in place. Testing for Pompe has been in place for six months; they have already identified eight positive cases. The panel will be submitting a “Program Revision Request” to fund these two new tests AND will include the future of NBS in the proposal as more diseases (Krabbe?!) will be added in the future. The Department of Health has created a new brochure about Newborn Screening to better educate new moms and dads about what is available in Pennsylvania and how it works. It will be visible on their website in a couple of weeks. The panel is hoping to merge the two panel system that currently exists in Pennsylvania, which would make ALL of the testing mandatory and not optional for each hospital (meaning that all babies would finally be screened equally and your zip code won’t determine life or death!). 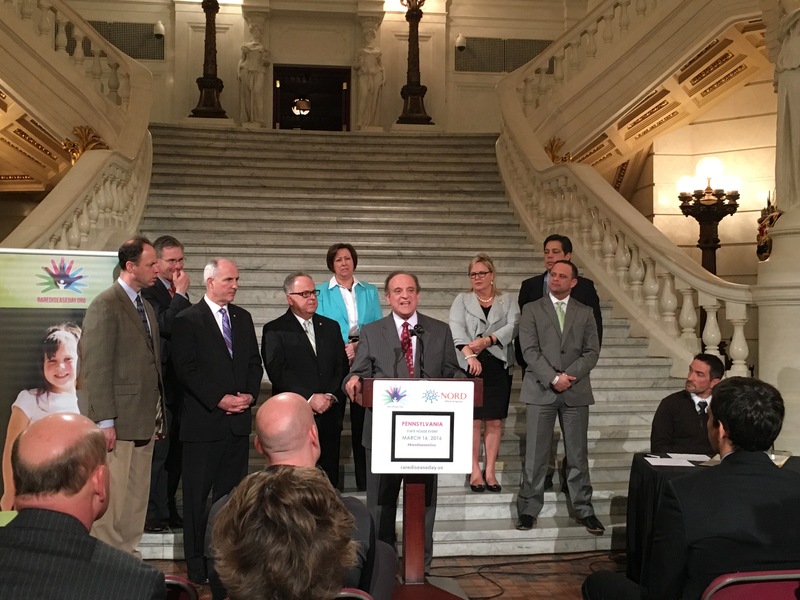 Currently, only seven diseases are mandated in Pennsylvania; the rest, including Krabbe, are on a “follow-up” panel and each hospital chooses which diseases from that list will be included on their screenings. Ridiculous, I know. Thankfully, they all see that it’s ridiculous, as well. 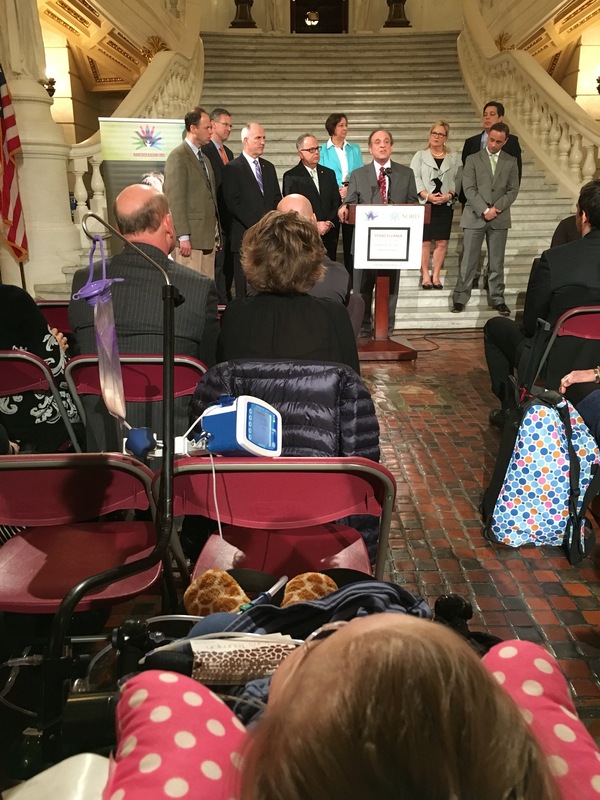 According to PerkinElmer – the lab through which all of the testing is done – Hershey Medical Center is STILL the only hospital in the entire state testing every baby for Krabbe and for the other five lysosomal storage disorders (LSDs) in Hannah’s Law (Act 148 of 2014). I verified YET AGAIN that if a mother asks for her child to be screened for Krabbe in a Pennsylvania hospital (or birthing center), the hospital has to do it. PerkinElmer said that only a handful of requests for Krabbe testing have come through, which shows a great need for education until the testing is mandatory. During the “public comment” section at the end of the meeting, I was able to address the issue of hospitals telling their patients that their babies were being screened for Krabbe automatically, and the panel was genuinely alarmed that this is happening. This launched a discussion about how they can improve the communication and education because it’s a serious problem and is also opening up hospitals (and the state) to law suits. In regards to Krabbe specifically: I asked Dr. Vockley if the conversation he had with Dr. Kurtzberg in July had affected anything (they spoke about her research and she schooled him, basically); he stated that until something is published, nothing will change. We know that Dr. Kurtzberg has submitted data for publishing, so now we just wait. Once that data comes out, it sounds like having Krabbe moved to the Mandatory Panel could happen quickly. Maybe. Afterward, Rep. Cruz’s staff (Ashley and Rachel) and I spoke with Dr. Vockley for quite a while regarding Krabbe and Newborn Screening, and, overall, he was FAR more positive (and respectful) this time than he was three months ago. I believe that his conversation with Dr. Kurtzberg has shown him that there is MERIT in screening for Krabbe at birth; that the transplants are successful; that it’s WORTH IT. He mentioned again the lack of data about the success of NBS and transplants for Krabbe; so, I pointed out to him that since only FOUR states are screening, it’s no wonder that we have no data! 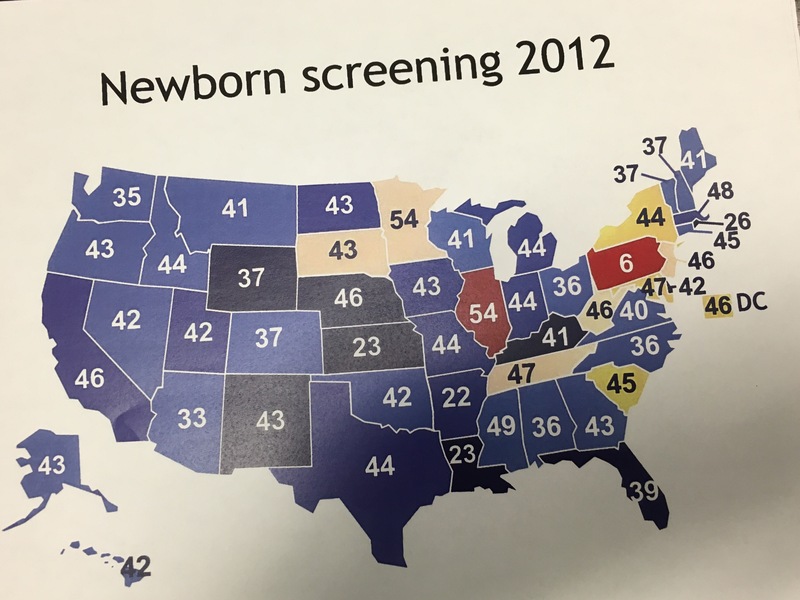 If you aren’t screening at birth, you aren’t catching it early enough to transplant, therefore, no data. He surprisingly agreed with me. 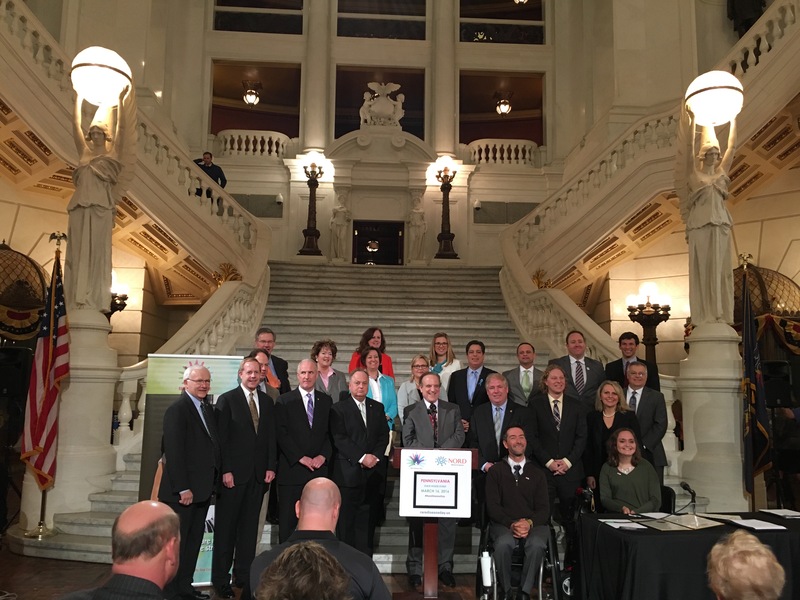 I then added that, since Pennsylvania has such a high rate of leukodystrophies, WE could be the state providing that data and making headway in research. And he agreed with me there, too! 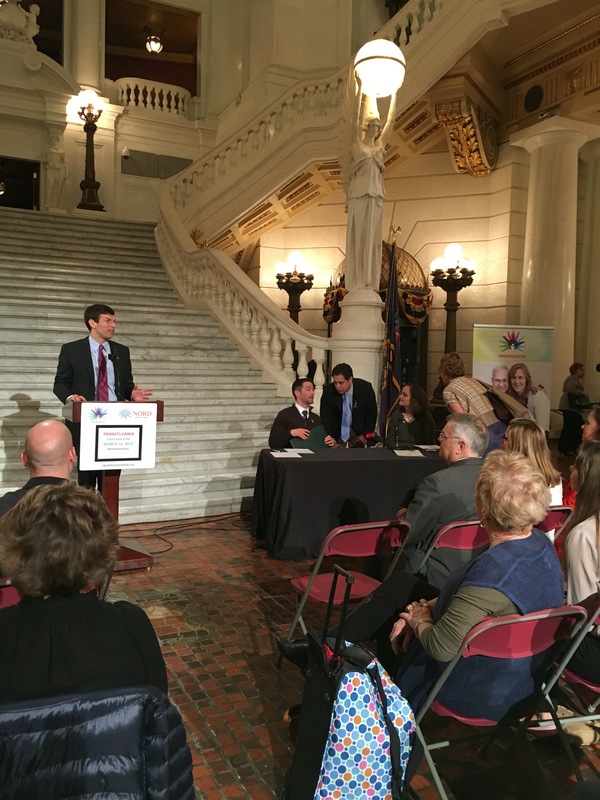 In summary, there have been no changes, no possible implementation dates, BUT, overall the attitude toward NBS screening HAS seemingly changed, and we feel hopeful that it won’t be long before every single baby in Pennsylvania is given a chance at life because of NBS. If you read all of this, thank you. 🙂 Please spread the word to other Pennsylvanians so that every new mom is aware of the options for Newborn Screening! No matter what state you live in, you can write letters to your legislators HERE and let them know that this is important to you! September is Krabbe/Leukodystrophy Awareness Month AND Newborn Screening Awareness Month. Let’s do our part to educate! 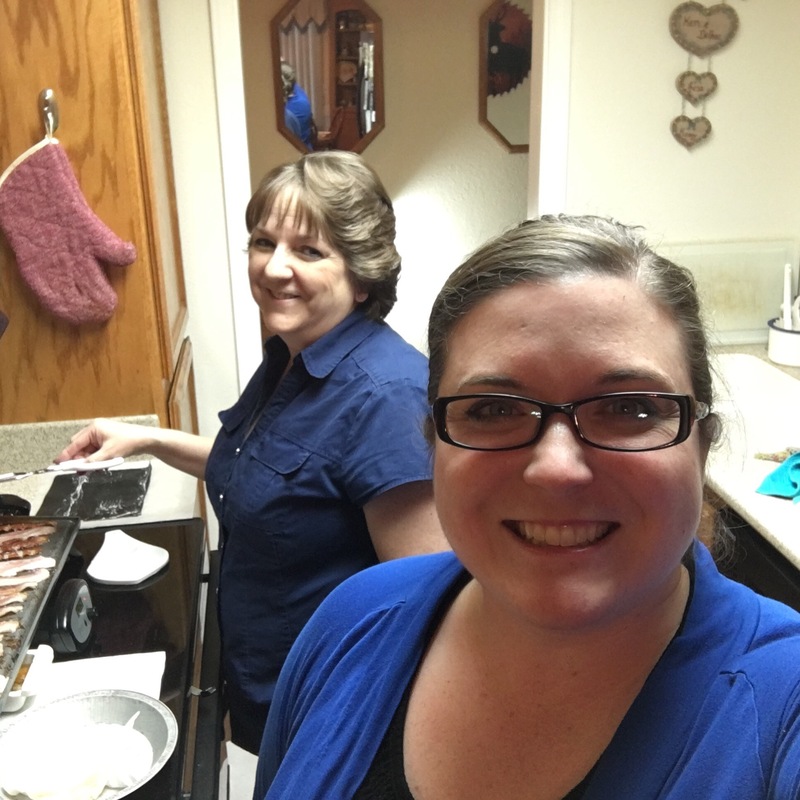 While my dad was still in Pennsylvania with us, I came up with a plan to fly to California for a week over Mother’s Day weekend as a surprise for my mom and grandmothers (and everyone else). Brennan and I had enough miles through United to make the trip practically free and I had the availability, so we booked the trip! My dad picked me up and we headed north to Red Bluff (a little over three hours). My mom, a Customer Service Manager at Walmart, was still at work when we arrived. Because I hadn’t yet seen the brand new store that opened the week after Tori went to Heaven, we decided to go to the store to surprise her. We had hoped to find her rather than have her see us. Well, the reveal didn’t go exactly as planned because she found my dad first (I was in an aisle shopping) and saw my purse – exactly like hers – in the cart. She asked my dad why he had her purse and he had no answer! 🙂 I came around the corner and saw her there and she was shocked. Needless to say, she had no idea that I was coming. 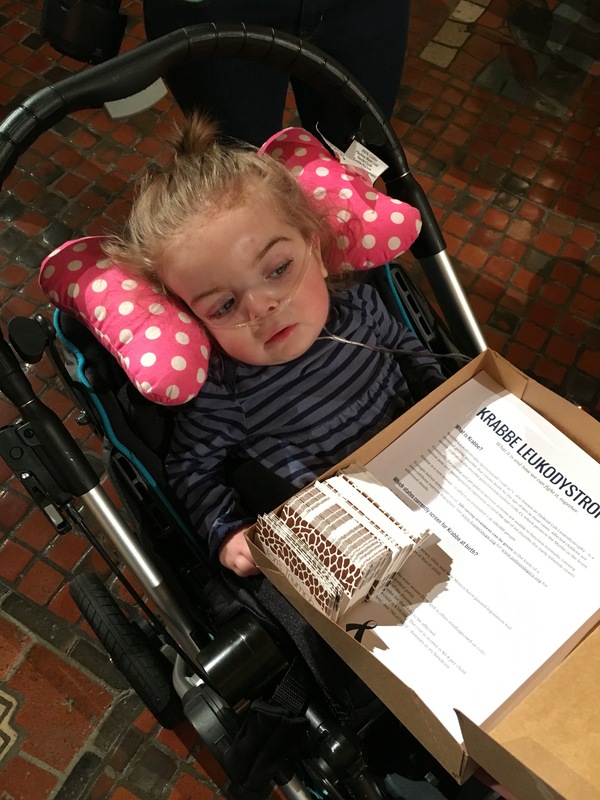 I’ve been able to spend time with family and a couple of friends thus far, and we have meetings with the staff of my parents’ legislators to discuss Newborn Screening for Krabbe. California has seen legislation for this in the past (as recent as 2012) but has never added Krabbe to their panel. We’re seeking to change that. It is going to be a great week at “home” and I’m so glad we were able to make this happen. 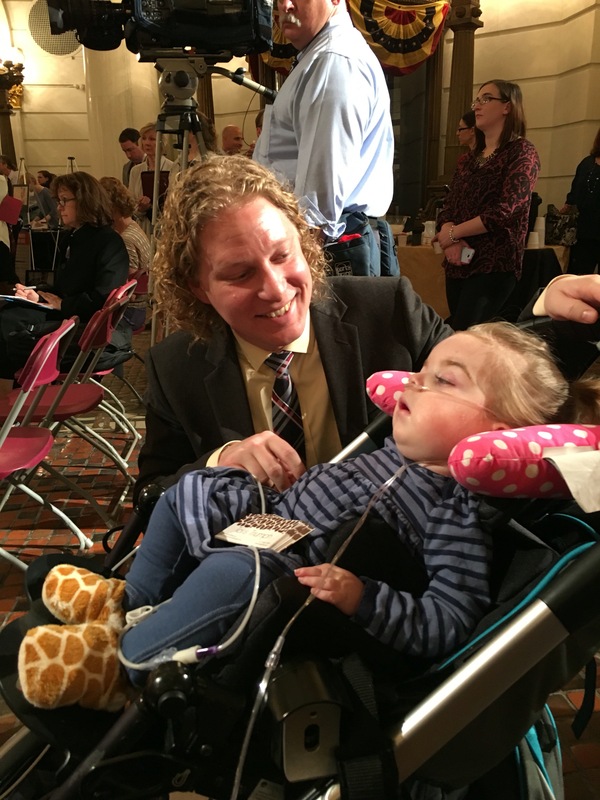 Tori’s story being in the news last week has started an amazing campaign to get Pennsylvania to start screening all newborns for Krabbe and other similar genetic diseases! The law was passed over a year ago but has yet to be implemented. 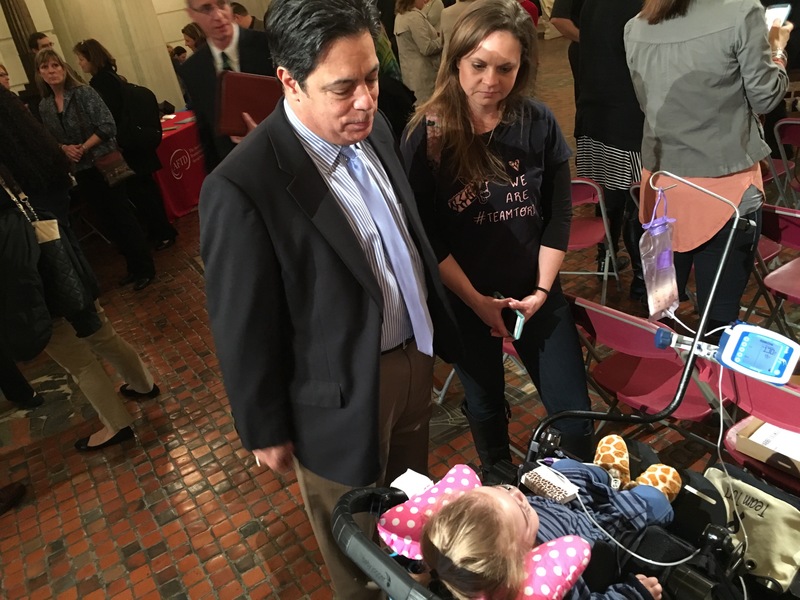 Hunter’s Hope has created a form to make it very easy for Pennsylvania residents to contact their state representatives in regards to the implementation of Act 148 of 2014 (“Hannah’s Law”). Please send a letter – it takes thirty seconds! Then share this with everyone you can. You can personalize the letter for Pennsylvania and send it here. If you aren’t a resident of Pennsylvania, you can write your own state legislators here. Let’s make it known that we want newborns to be screened for Krabbe at birth!